The retail sales tax collections stars aligned for three of the four MSA in NE Tennessee in September. 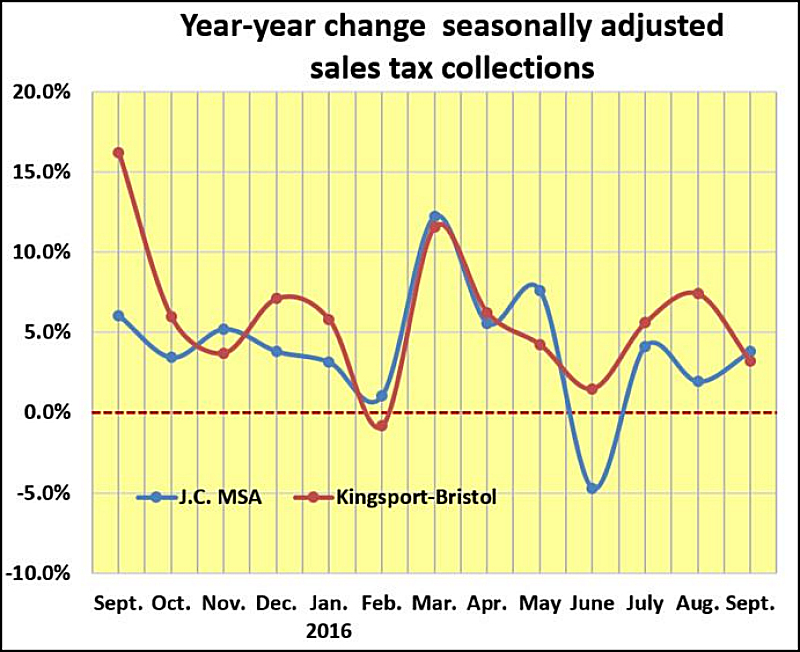 Year-over-year collections in Kingsport-Bristol, Johnson City and Knoxville were close to each other – very close. The fourth area MSA – Morristown – outpaced the other regions and the state as a whole with a 7.7% increase. The only other MSA with a higher gain was Cleveland, up 14.5%. September was only the third time in the past 13 months when year-over-year were a close. As you can see from the chart, the overall tend patterns align in most months but with quite a bit of separation. The Johnson City MSA also broke its three-month decline in the share of total Tri-Cities collections in September but only but 0.1%. During the month Johnson City’s share increased to 49.1%. Johnson City has been within a point or less than claiming half of the total Tri-Cities sales tax collections for years. It has accomplished that goal seven times since 2011, but the most recent example was April 2014.